Product #2611 | SKU AT8010 | 0.0 (no ratings yet) Thanks for your rating! The AT8010 requires 11V to 52V DC phantom power or a 1.5V AA battery for operation. A battery need not be in place for phantom power operation. An integral 80 Hz high-pass filter provides easy switching from a flat frequency response to a low-end roll-off. The roll-off position reduces the pickup of low-frequency ambient noise (such as traffic, air-handling systems, etc. ), room reverberation and mechanically coupled vibrations. The high sensitivity of the AT8010 assures useful output and an excellent match to most input sources. 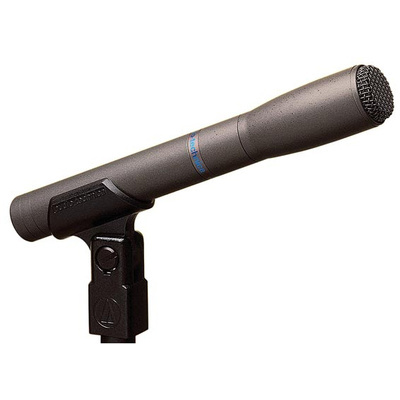 In some cases, however, an attenuator such as the Audio-Technica AT8202 may be required between the microphone and preamplifier to avoid overloading sensitive input stages. Maximum Input Sound Level: 137 dB / 123 dB SPL, 1 kHz at 1% T.H.D.